Also attending was Douglas's wife, the actress Catherine Zeta-Jones and other family members. 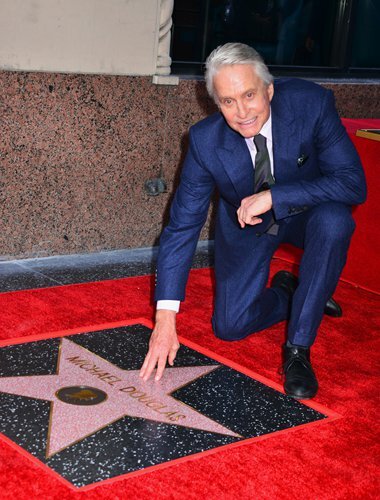 "This is a great honor and I'm not getting any younger, I want to enjoy it with [my family]," the 74-year-old actor said as the star was unveiled. Douglas got emotional and teary-eyed as he addressed his father, telling him that his presence meant a lot. The younger Douglas was just 29 when he earned his place among Hollywood's elite as the producer behind One Flew Over the Cuckoo's Nest, then the first movie in 40 years to sweep the "big five" Oscars for best picture, director, actor, actress and screenplay. He went on to win another Oscar - this time for best actor in Wall Street (1987) - and became one of the most bankable stars in the world through a series of roles in cinematic hits including Romancing the Stone, Fatal Attraction and Basic Instinct. His new comedy series, The Kominsky Method, begins streaming on Netflix on November 16.